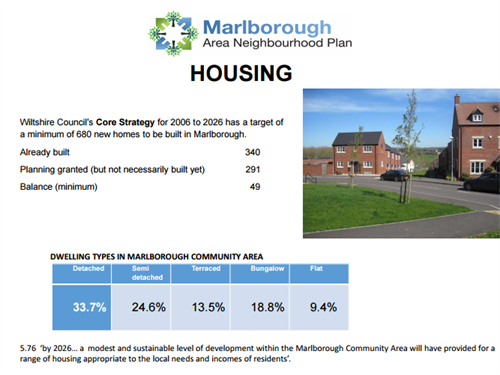 From consultation undertaken as part of work on the Marlborough Area Neighbourhood Plan, it was clear that affordable housing was a major concern to those living in Marlborough, Mildenhall, Preshute and Savernake. To follow this up with robust evidence, a Housing Needs Survey was undertaken and a report issued. The independent consultants commissioned to undertake this work came to Marlborough to give their feedback and analysis of the report as well as the results of an associated survey about business and employment at a public meeting at the Town Hall on Tuesday, 24th October at 7pm. The subject of housing emerged early in our public consultations as an important community need. Marlborough has fairly limited amounts of land available for housing due to its geographic location, this makes it very important that the limited land that is available is used to build housing that meets the needs of the community. Unfortunately, the Government’s market-led housing strategy has resulted in developers building for maximum profit rather than to meet community need. This has resulted, in Marlborough, in the building of expensive retirement complexes on brownfield sites and an oversupply of “executive” four and five bedroom homes on greenfield sites. The clear need in the community is for affordable starter homes for young families and a lack of them is causing a problem in retaining young families and a subsequent labour shortage. The Neighbourhood Plan aims to address this issue and has now completed an independent housing needs analysis in order to provide clear evince of this need. To download a copy of the Housing Needs Report please click here.